Who's not excited for the Super Bowl, I can't think of anyone! The parties are all well underway and with teams getting ready with their lasts game practice, media day past and gone, everyone is now waiting and preparing for the big day to arrive. It's all taking place this Sunday Feb 2 in MetLife Stadium, East Rutherford, New Jersey, for those who will be going to the stadium we wish you good luck and we hope you enjoy yourselves, for those of us who will be enjoying the game or the commercials at home with friends and family we would like to share some tips on how you could enjoy a lovely and exciting party without all the hassle. A party can never be fun and exciting without good food and a nice mix of drinks, for adults and for the underage as well. The best part of using disposable partyware is that once the party is over you don't have to get yourself to work washing everything, you can actually go home or to sleep just like the rest of the party guests, just clear everything in the trash and you're done! How easy and fun was that. In the photo above we give you a simple party setup with fruits, veggies and some snacks. The products used in the photo are all made of premium disposable plastic, they are recyclable as well where applicable. Starting with our premium Gravy Boat filled with salad dressings for dipping such as from Kraft - Green Goddess Dressing, it is savory and vibrant, to this we added some delicious cut Persian cucumbers cut in a Square Wave Mini Bowl from our Wavetrends collection. We move on to the beautifully red strawberries displayed nicely in the premium Trifle Bowls. Move over to the Mini Margarita glasses filled with fresh reaspberries and we added our silver cocktail pick for easy eating and not making your fingers red from the berries. Now to the drinks we give you our best bomber shot glasses, it's a 2 part shot glass, we're sure you remember this from your collage days, we won't go into details. 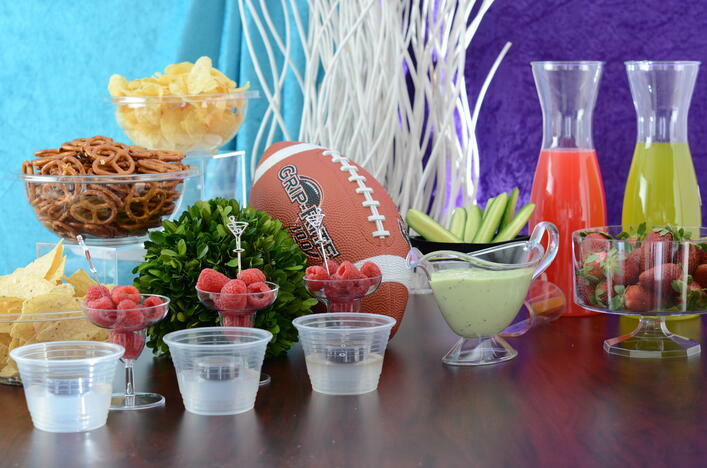 How well are our Super Bowl collection to be used at the Super Bowl party, they are made of sturdy PET material and have lids to them that fit perfectly, so that you can prepare the snack in advance without being worried that they'll get stail or spill while trasporting them if the party is not in the same location. Our premium Sturdy serving pithcers or carafes can hold up to 35 oz and are really crystal clear, they enhance any drink that's in them. There you have it, a mini party setup in no time, giving you that upscale and fancy party look. Here's what you gain, quick setup time, hassle free, don't worry if the guys get loud and stuff fall in the floor, they won't crack and if they do don't worry it's disposable and last but not least the cleanup will take you no time and anyone can help you just throwing them into the trash can. Here's another tip how to setup your Valentines Day Party with your loved one.